Berlin based performance artist and musican Marco Barotti comes with a new video. If you didn’t have the chance to hear his album from last year (Barotti: Rising LP) now you get a wonderful reminder. 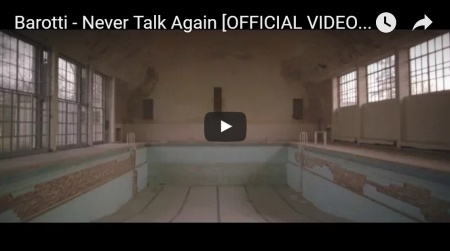 Never Talk Again is a song, or better, an opus magnus of electronic – avantgardism. Straight out of Barotti’s phantastic mind. Recorded with an orchestra of strings and horns and the sound of some vintage sinths from the 1970ies. All made in Marocco in long jam sessions. Then edited and reworked in Berlin. The video for Never Talk Again was shot by Camilla Mantovani.